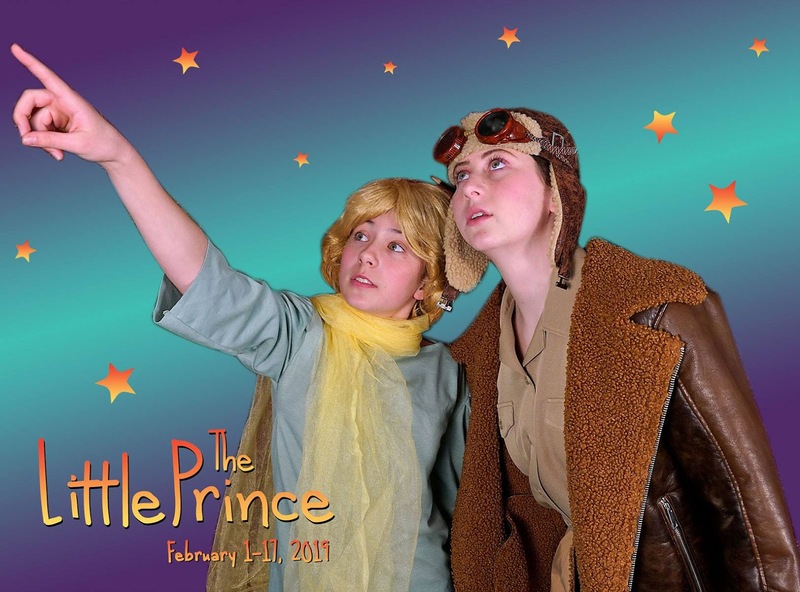 Based upon Antoine de Saint-Exupéry’s delicate and enchanting tale of a mysterious little boy and his adventures through the universe, Young Artist Ensemble is currently producing a charming and whimsical youth production of Rick Cummins and John Scoullar's The Little Prince although bear in mind that this does not include any musical numbers. McKenna Keiser (Little Prince) and Charlee Lambert (Aviator). Photo by Paul Cranmer. The talented and charming young cast is led by a fantastic McKenna Keiser as Little Prince who impressively is rarely off stage during the entirety of the show and expertly manages to showcase all matter of emotions, feelings and sensations making the Little Prince well rounded and lovable. Keiser truly impresses when she is moving the story forward through monologue after monologue that is no small feat for even the most experienced of adult actors. Her co-star Charlee Lambert gives a more nuanced and subdued portrayal as the Aviator all the while doing a great job charging through her equally lengthy monologues and meeting her own demanding stage presence needs. It is Lambert's dry wit that will have you smiling time and time again and how can you not feel the tuggings on your heart when she admits to the love and respect she has for her little friend. Sophia Davies (The Snake) despite having very few actual lines was mesmerizing as she gracefully moved around on stage interacting with the ensemble and two leads. I would not be surprised if she has had some classical dance training. Maddie Ragsdale (The Rose) was sheer perfection and a great choice for the first allegorical figure we come upon on our adventures to help ready the audience for what delights they were to enjoy. She was exactly what you'd hope for from The Rose - vain and lovable. There was no reason to doubt why Little Prince would want to return to her side. In fact as an audience member I kept wanting her to return on stage after her too brief first act scene. Thankfully that wish came true for a brief moment during Act Two. Michael Lindroth (Lamplighter) was another delight standing out as one of the very few young male actors in this female dominated production with his great comedic timing and humor. His short scene with Keiser was all parts delightful and charming. Cheers to Suzanne Tobin for directing this lovable production of The Little Prince in a simple yet effective manner without taking the material too seriously and for choosing to use the ensemble to create the moving scenery thanks to Jessica Coffman's scenic choreography and in connection with Mark Andrew Reyes' whimsical and simplistic scenic design that allows for the audience to engage with Little Prince's childlike imagination and stories. And props to Scott Chew who created The Aviator's airplane that can be found at stage right. Also of interest will be a projection screen at stage left where the audience can see The Aviator's drawings throughout the performance in addition to some clever shadow projections. This really is a great production from start to finish including fun and abstract costuming by Cindy Peltola. My only confusion with the production came from the choice to dress The King (a funny Gigi Velloso) in a gown with her hair down despite calling her King. I think it would have been easy enough to dress her in male clothes with her hair up similar to the other female cast members who play male roles or to change the character from King to Queen. Accessible: There are specific wheelchair spaces on the stage floor with companion seats as well as options for seating (open to the general public) on the stage floor without need to use steps. Parking: Free in a well lit parking lot. There are both stairs and an elevator option (in the igloo like structure) for getting downstairs to the theatre.